Kawai VPC 1 - "VPC1 is an excellent choice for MIDI only Piano simulation, not general midi keyboard use "
Rjm Music Technologies Mastermind GT/16 - "After a few months of han... well, feet-on experience using it..."
M-Audio Oxygen 49 MK IV - "A nice MIDI keyboard!" Voodoo Lab GCX Audio Switcher - "Great switcher!" 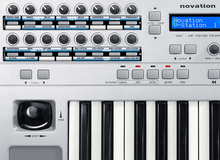 Fatar / Studiologic Acuna 73 - "Studiologic Acuna 73, no compotition"
Nektar Impact LX25 - "Compact et cool"
Native Instruments Komplete Kontrol S88 - "2 years with Komplete Kontrol and i have not looked back. "